A quick word of introduction for those who have only recently joined our crash course on the addictive subject of colocation: the term refers to the end-to-end process of providing a technical environment in which the client’s web server will run smoothly and at a reasonable cost. The most sizable percentage of all clients opting for colocation services in data centers is occupied by eCommerce companies seeking guaranteed server resources and a secure background for online transactions processed on their websites. The potential of colocation services is also highly appreciated by telecommunications companies which use the devices for traffic exchange with their partners and prospective firms via a high-speed connection. And finally, colocation proves useful to enterprises simply determined to protect their data from disasters as well as back up their data outside the company’s headquarters. You might be wondering now what the common denominator in all of these organizations is. The answer is far from surprising: each of them wants to track their resource consumption – most important being outgoing and incoming transfer and power usage – in the current billing cycle. What exactly is WHMCS? The Web Host Manager Complete Solution is a powerful business automation platform, a single pane of glass for client management, recurring billing, and customer support. It is the software suite of choice for web hosters and service providers, but not only. 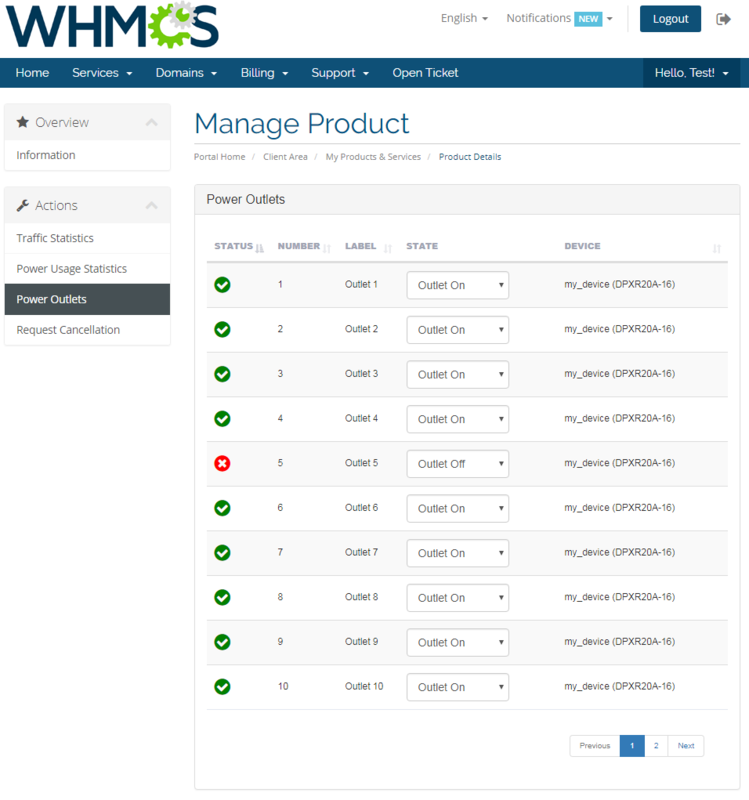 The present-day software market abounds in extensions and add-ons aimed to provide advanced functionality to the WHMCS platform, and the perfect example of such a solution is EasyDCIM Colocation For WHMCS. EasyDCIM Colocation For WHMCS is a free module developed by ModulesGarden in order to allow EasyDCIM colocation providers offer and manage their services without the need to leave the confines of the WHMCS environment. As regards your customers, they are empowered to not only place new orders directly from the WHMCS client area, but gain a clear insight into statistics of their already active services as well. To make sure you acquire full understanding of this practical fusion, let’s starts from the very basics. Connection between WHMCS and EasyDCIM takes place via API, and a few simple steps have to be taken in order to establish it. Ready? Go to ‘Setup’ → ‘Products/Services’ → ‘Servers’ and pick the ‘Add New Server’ function. Then, select ‘EasyDCIMColocation’ from the ‘Type’ dropdown menu. 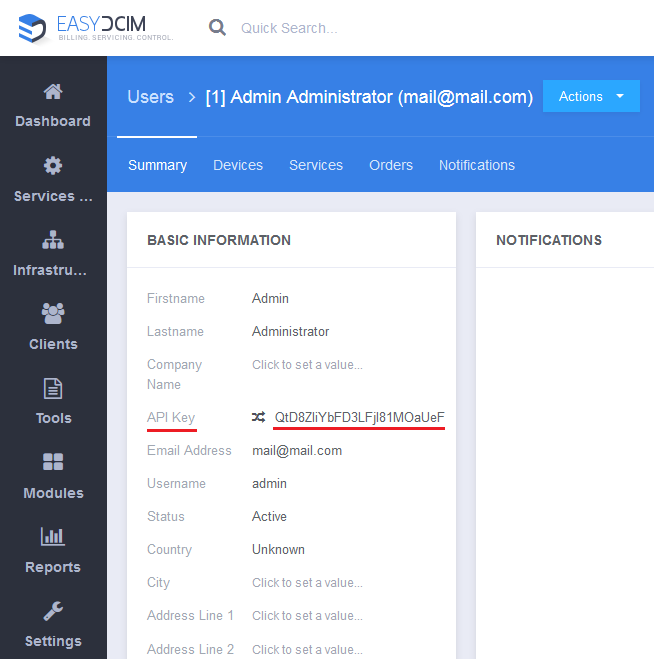 Enter the essential data, including the server name, IP address, user name and the password (API Key) which can be readily found in the EasyDCIM administrator profile – just take a look on the following screen. Not really sure whether the connection is established correctly? No worries! You can always press the ‘Test Connection’ button to clear up any doubts in this regard. Once the compatibility between EasyDCIM and WHMCS is secured, you are free to add your first product. Move to ‘Setup’ → ‘Products/Services’ → ‘Products/Services’ and choose the ‘Create New Product’ option. Just see how quickly it can be done! As soon as your product is up and running, head to the ‘Module Settings’ section and select the desired module and the server group. All the ins and outs of the configuration procedure can be thoroughly explored here. Auto Accept – each newly added order in EasyDCIM receives by default a pending status. Then it is the administrator’s task to accept it manually, creating the appropriate service. Only after the service has been activated in the EasyDCIM panel will WHMCS cron immediately update its status. To accelerate this process, you can choose the ‘Auto Accept′ option to make WHMCS automatically accept each new EasyDCIM order and match the most suiting colocation on the basis of the provided criteria (model, location, etc.). Service Access Level – allows to handle sets of prearranged permissions for end customers. 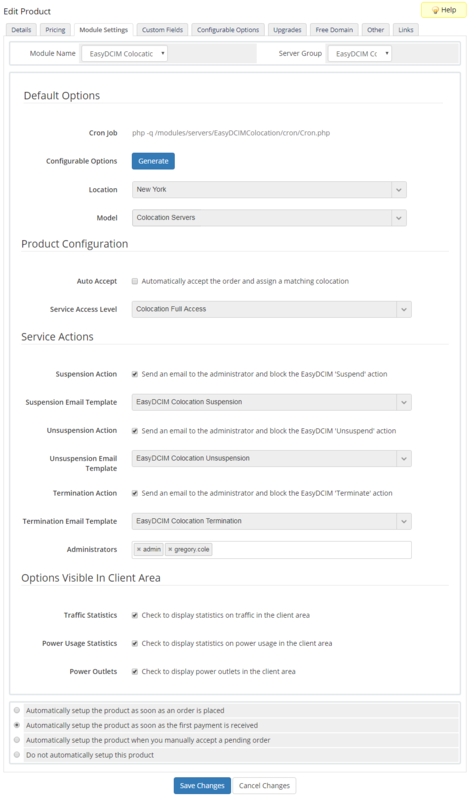 In the configuration section of a given level in EasyDCIM you can choose elements to which your clients should have access from the client area in your EasyDCIM panel, and which ones will remain off limits to them. This is the exact place where you can determine if such actions as ′Suspend′, ′Unsuspend′, and ′Terminate′ are to be performed automatically both in the WHMCS system and the EasyDCIM panel. If you decide to disable these actions, they will be executed in WHMCS only and all authorized administrators will be sent an email with an appropriate notification. The synchronization process should start with creating a WHMCS service for the previously created product. 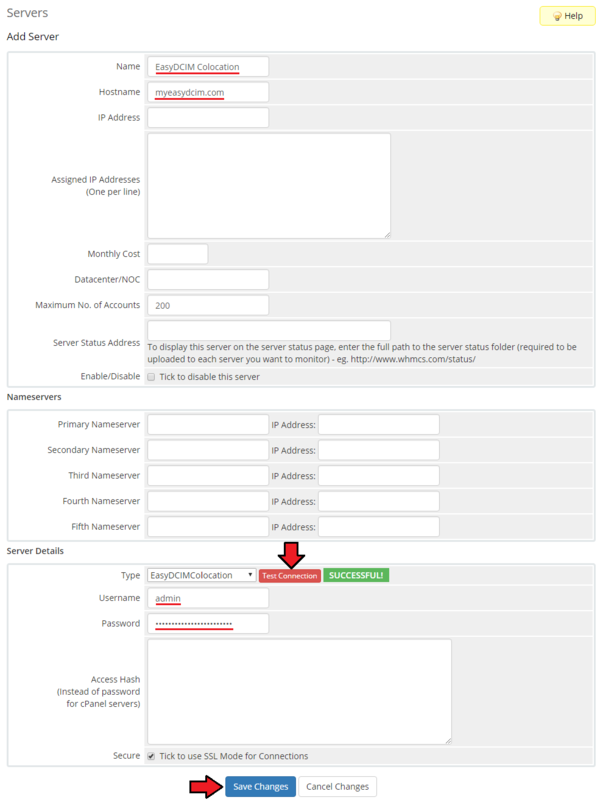 Create – sets up a new order in the EasyDCIM panel and updates the ′Order ID′ field to which the ID of the EasyDCIM order will be added. If you have ticked the ‘Auto Accept’ option in the product configuration section, EasyDCIM will attempt to accept such an order automatically. 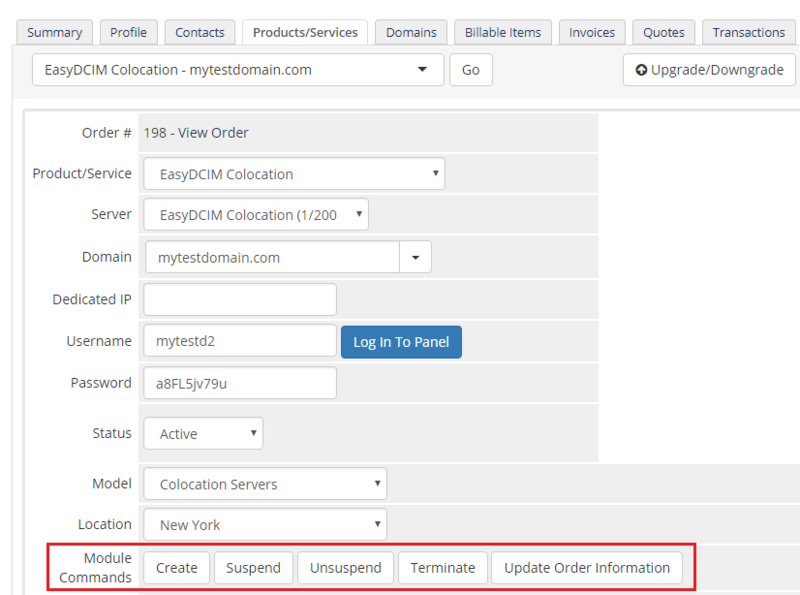 Terminate – sets the service status in the EasyDCIM panel as ‘Terminated’. During this action a colocation service is being unassigned from the client who previously owned it. The colocation status then changes to ′Available′, making the service ready to be ordered by another client. Update Order Information – this particular action works in the same way as CRON working in the background. Once it is launched, it initiates the process of searching for an order with the same exact ID as the one set in the ′Order ID′ field. If such an order is located and displays active status, a corresponding colocation identifier will be entered in the Server ID field. 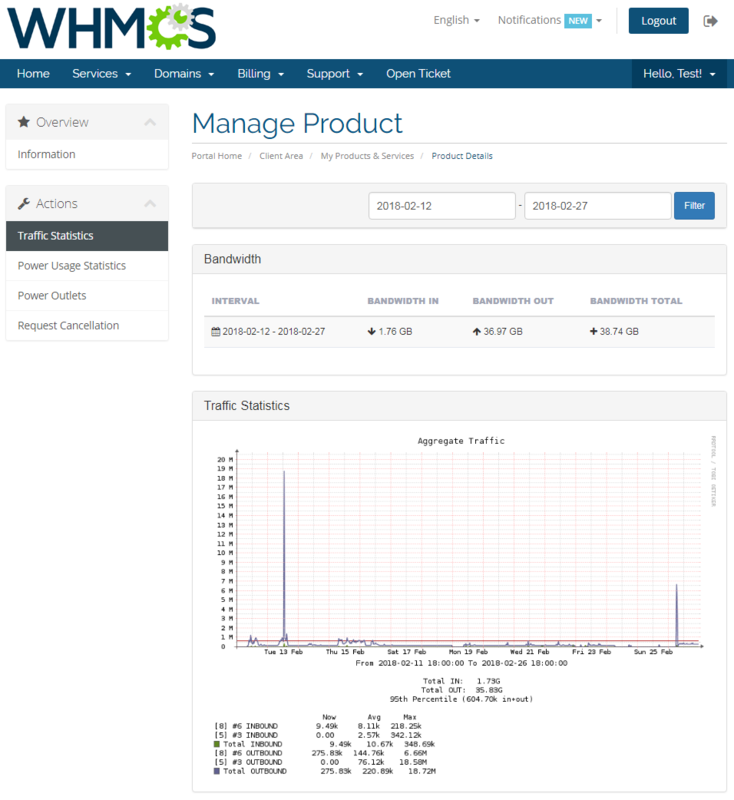 As you can see, the synchronization between WHMCS and EasyDCIM takes place via two fields: Order ID and Server ID. The former contains the order identifier from EasyDCIM and is used to carry out such actions as ′Suspend′, ′Unsuspend′, ′Terminate′ and ′Update Order Information′. The Server ID field, in turn, holds the colocation identifier which is managed by the end customer – the same colocation that had been assigned to the order in the EasyDCIM panel beforehand. Charging for transfer and power consumption is carried out by means of the Advanced Billing For WHMCS module. This powerful billing tool developed by ModulesGarden provides a whole variety of advanced functionalities including billing for the actual server resource usage and generation of fully customizable invoices. 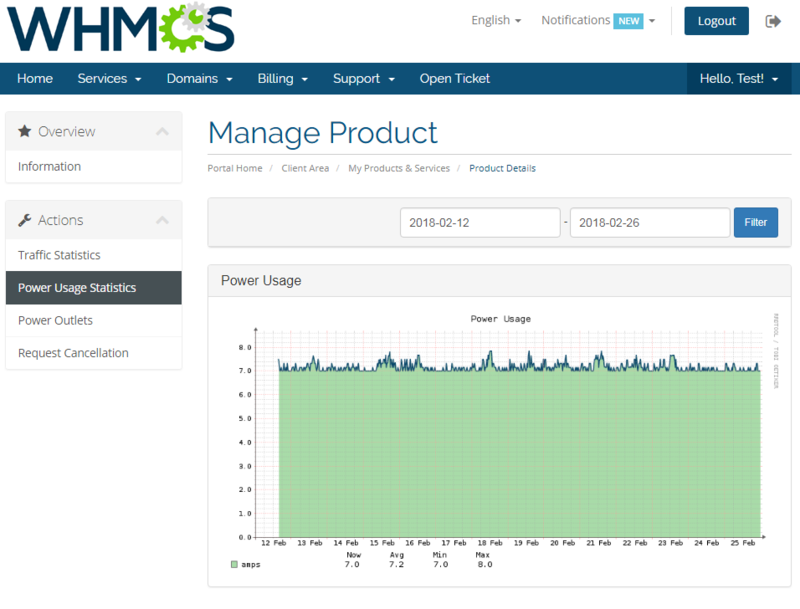 EasyDCIM Colocation For WHMCS is equipped with three billing submodules: bandwidth, 95th Percentile and power usage. Bandwidth – billing based on total inbound and outbound traffic accumulated from all devices assigned to the colocation. 95th Percentile – billing according to the 95th percentile method. The algorithm called the 95th percentile involves a cyclic registration of the link load for the interval of 5 minutes where 5% of samples with the highest value are being rejected. All of this to avoid charging end customers for temporary data flow spikes resulting from sudden, short events or registration errors. Power Usage – billing based on the power consumption measured in amps. You have made it! Your new colocation service has been successfully created, activated, and assigned to the customer who can now manage its key components freely from the WHMCS client area. 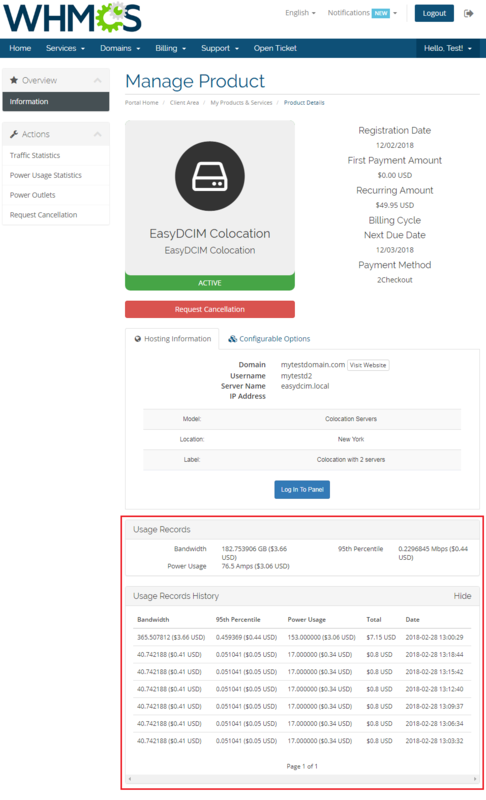 To gain access to all basic information on colocation – from model and location to its label assigned in EasyDCIM – your clients will have to take just a few quick steps and head to the summary view of their colocation service. Here, they will also be able to monitor their present-day charges for the used resources. In the ‘Traffic Statistics’ section clients can control both current and past transfer usage for the entire colocation. Since traffic is accumulated from all devices within a colocation, customers have all the necessary information on aggregation gathered and presented in one place. The ′Power Usage Statistics′ section presents the accumulated power consumption from all PDU devices assigned to the colocation with values measured in amps. Additionally, by assigning specific power outlets to a given colocation, you automatically provide them for end customers who will be able to manage them remotely using the ′on′, ′off′ and ′restart′ options. The very same actions can be performed by the colocation owner from the ′Outlets′ section. EasyDCIM Colocation For WHMCS is one these software solutions that you use once and refuse to trade for anything else afterwards. Bill your clients using not one, but two ultramodern systems fit with all the right tools to deliver colocation services at a sky-high level, and you will see why! EasyDCIM v1.4.4 – The Era Of Reports Has Begun!